Film Puts Spotlight On Green Berets The documentary Why We Fight Now tells the story of the Green Berets, the elite Special Forces soldiers whose specialty is counterinsurgency. They're known as the "quiet professionals," but a few years ago their commander decided to make a film about them — and its message is proving to be timely. There are six 10-minute clips of Why We Fight Now on YouTube. Watch Part 1, Part 2, Part 3, Part 4, Part 5 and Part 6. The Green Berets, elite Special Forces whose specialty is counterinsurgency, are known in the military as the "quiet professionals." But a few years ago, their commander decided to make a film that gives them something of a shout-out. Now, Why We Fight Now is proving to be timely — especially because counterinsurgency is the kind of war being fought in Afghanistan. The film, co-produced by Frank Capra Jr. (who died just as the film was being completed), has no narration and consists mostly of Green Berets talking about their work. Its title is a nod to the World War II series produced by Hollywood filmmaker Frank Capra for the U.S. War Department, Why We Fight. The new film was directed by Mark Benjamin, a 62-year-old Manhattan filmmaker — who might seem an odd choice for the job. "I've always been anti-war and never thought I would ever work for the military," Benjamin says. On the wall in Benjamin's office is a poster of Che Guevara. But there's also a picture of a Green Beret handing a piece of food to a child in Afghanistan. Benjamin's political evolution is due in no small part to the terrorist attacks of Sept. 11, 2001. He knew people who died and has made several films dealing with the day's repercussions. "Because of Sept. 11, I became this liberal hawk," he says. "My own political perspective on global conflicts, democracy, capitalism, human rights — everything changed. I certainly became more militant. I think we should go after terror wherever it is, you know. I support that." The military chose Benjamin because it wanted someone who had made both documentaries and commercials. "They wanted it to be slick and they wanted it to be a film that would promote Special Forces," he says. Benjamin's crews filmed Green Berets in action in Iraq, Afghanistan, the Philippines, Colombia and Africa. There was a premiere screening a year ago at Special Operations Command in Fort Bragg, N.C.
Roger Carstens, a former Green Beret who is now a non-resident fellow at the think tank Center for a New American Security, watched the film at Fort Bragg with a Green Beret friend who had recently returned from Afghanistan. "We both felt it did a great job of telling what we in Army Special Forces do in our approach to countering insurgencies and dealing with an unconventional threat," Carstens says. "But we also figured the Army would squash it." It didn't. The film was broadcast on the Armed Forces network on Sept. 11 this year. Since then, according to a source in Special Forces, a superior in the Special Operations Command ordered that the film be edited to tone down statements about Green Berets being best suited for counterinsurgency work. There is a rivalry between the Green Berets and others in Special Operations Command, as well as with other branches of the armed services — all of them competing for tight budget dollars. "I think the Army is wrestling with resource battles," Carstens says. "Where do we put our personnel and our money into creating the Army of the future? 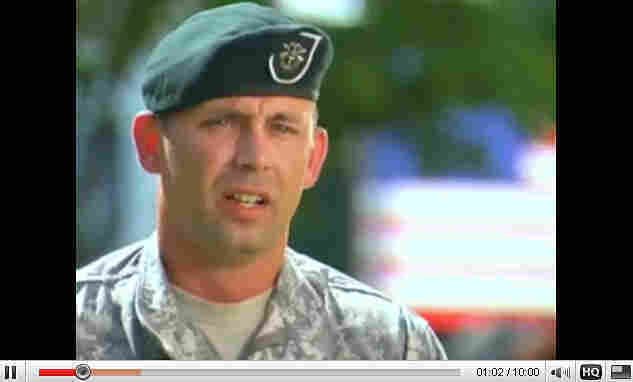 And so as an Army general, I'm not sure I'd want Special Forces to come out and say, 'Hey, Coach, we have the answer.' "
The Green Berets are currently adding five new battalions, according to one Green Beret officer. Representatives from the unit declined to be interviewed on the record. The film's associate producer, Chris Cooney of Screen Gems, says military brass in Special Forces is picking the right moment to "deploy" this film. And Cooney confirms that the film is currently being edited — for television. "We don't know whether or not it will be picked up, but the editing is to tailor it for television programming," Cooney says. "It should be seen by the general public because it has a message that I think lay people should understand."